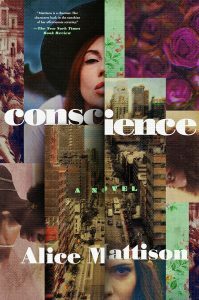 An excerpt from my review of Alice Mattison’s new novel Conscience, just published in Consequence Magazine. Consider: A man sets his baby on the sidewalk, walks a short distance away, and sets himself on fire. Does the fact that he’s brought his child to his self-immolation prove he is out of his mind? Or is he making a point: that an unattended baby on an American street in 1965 will be rescued to safety, while Vietnamese babies continue to die? Consider: A radical new program is proposed at a social services agency. This program will provide something beautiful, something important, that no other agency provides—but it also carries undeniable risks. Do the dangers outweigh the beauty of the idea? Consider: A fleeting moment between a mother and her child inspires a drawing, which is then preserved for centuries in a museum. What matters more: the drawing itself, which endures, or the humans in the drawing, who disappear in time? Does art-making matter at all, when wars rage? Do two human lives matter, in the long run?